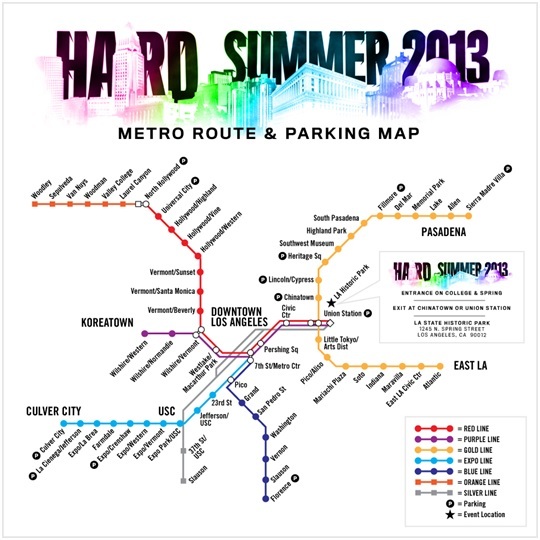 HARD Summer starts tomorrow and all HARD Summer attendees can ride Metro for FREE to and from the concert. On concert days between 10 a.m. and 7 p.m., locate the Metro TAP employees in blue shirts at each station entrance (except at Vermont/Beverly and Wilshire/Normandie), show them your HARD Summer ticket or receipt and they will tap you through the turnstiles. If you are unable to locate the Metro TAP employee or are not traveling within the designated hours, use the Gate Help Intercom located near the turnstiles and Metro will be able to assist you. Metro will operate on regular 2 a.m. late night service on Saturday. Metro will also run special extended service just for HARD Summer on Sunday. West to Culver City will leave 7th St./Metro Ctr. at 1:30 a.m.
East to Norwalk will leave Willowbrook/Rosa Parks at 2 a.m.
West to Redondo Beach will leave Willowbrook/Rosa Parks at 2 a.m. Extra buses to Warner Center and Chatsworth will leave North Hollywood at 1:15 a.m., 1:35 a.m. and 1:55 a.m.
North to El Monte Station leaves Union Station at 1:20 a.m.
South to Harbor Gateway Transit Center leaves Union Station at 1:31 a.m.
For more details on getting to the concert via Metro, use the Trip Planner at metro.net. We need more of these type of co-operations. Imagine if the LA Phil had the same thing. Or if, when you bought your ticket to a USC football game (or Kings, etc. ), you could upload a day-pass for that day to your TAP account. Go HARD with Metro – sponsored by Cialis? I like the design of this event-based Metro map and hope it can be easily updated for other popular events. My two suggestions: It would be nice for the most event-adjacent stations to be better highlighted on the map; and in its present form, the map makes it appear that the Blue Line ends at Florence Station. (A fading blue-colored line heading south might help clear up that confusion.) Otherwise a good template to provide to event promoters to encourage their attendees to use the Metro. ….oh, and the Silver Line also could use a “fade-out” line to indicate it doesn’t end at Slauson Station.